One of the slight drawbacks of the iPad, and touch computing in general, is that, well, everybody touches your computer screen, leaving unsightly smudges. Apple is taking a step towards addressing this problem with a brand new, self-cleaning smart cover that doubles as a reading stand. 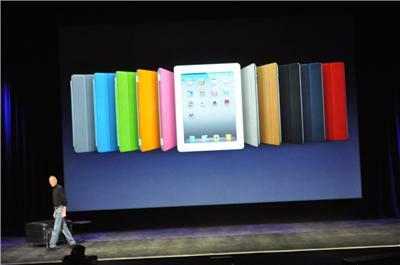 It wasn’t the biggest announcement at today’s iPad 2 event, but it is one of the cleverest. 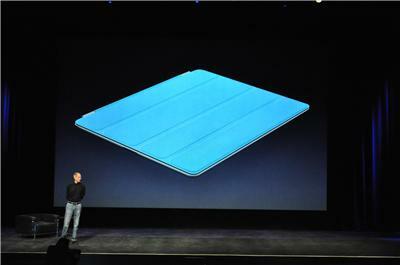 “This isn’t a case anymore,” Steve Jobs said during his keynote. 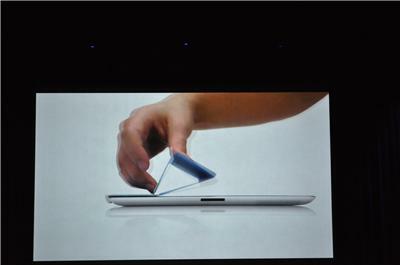 “It’s a cover for the screen. The micro-fiber screen cleans the screen every time you close it, and it’s incredibly minimal.” The cover snaps on and aligns itself with magnets. And you can roll it back to create a triangular tube that doubles as a reading stand. 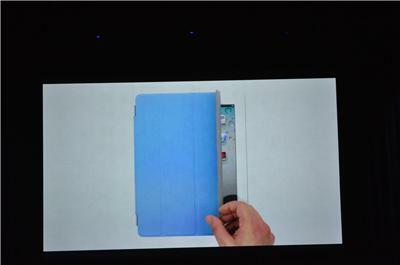 It also wakes up the iPad when you roll it back, and puts it to sleep when you cover it, just like when you close the lid on a MacBook. “And it comes in polyurethane,” added Jobs, “which is used to make space suits!” The polyurethane cases will cost $39 and come in a double rainbow of colors. 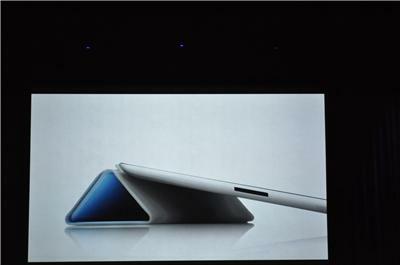 It also comes in leather, which will be $69. Your fingers will still create smudges, but now you can clean them every time you put away your iPad. Maybe you’ll have to rub it a little.